Introducing the BRICK RACK Display System for your LEGO sets, Minifigures and your LEGO creations.Each BRICK RACK features unique, custom grooves designed just for your LEGO bricks. Just slide them in and start building! • BRICK RACK Model 7 will display 175 Minifigures. • BRICK RACK Model 4 will display 100 Minifigures. • BRICK RACK Model 3 will display 75 Minifigures. Let BRICK RACK be the canvas to your LEGO creations. Organize, display and enjoy your LEGO investment with the uniquely versatile BRICK RACK! There are three BRICK RACK models to choose from, starting at $35.95. Just slide your LEGO or other compatible construction bricks into the custom groove and start building. Display your LEGO sets or your own creations! Minifigures agree that it is more fun to be displayed on BRICK RACK, than laying on the floor or in a box in the closet. "I love my new home." 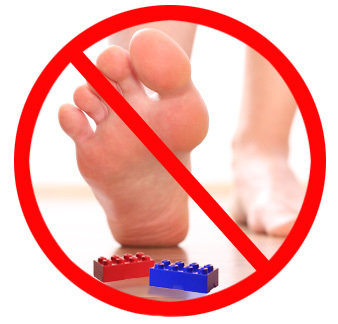 You have probably stepped on LEGO before. ** OUCH! ** Now you can get your LEGO off the floor, and enjoy their colorful wonder in a BRICK RACK Display System. © 2013-2014 Doss Industries . All trademarks, servicemarks, and copyrights are property of their respective owners. LEGO® and the brick configuration are property of the LEGO Group, which does not sponsor, own, or endorse this site. BRICK RACK is patent pending. Pop! Vinyl Figures by Funko feature your favorite characters modeled in the Japanese "kawaii" style. Kawaii means "lovable", "cute", or "adorable." About 4 inches tall, Pop! Vinyl Figures make a great desk buddy! Many models are also bobble heads. We also carry a wide selection of LEGO Minifigures and Displays. Planning a visit to the San Francisco Bay Area? Looking for a unique tourist destination? Visit the Burlingame Museum of Pez Memorabilia - the only place in the world to see every Pez candy dispenser ever made PLUS the World's Largest Pez Dispensing Machine! Over 900 unique characters are on display including Casper the Friendly Ghost, Popeye, Elvis, Bullwinkle, Hello Kitty. Smile! Go! Minifigure Display!! Introducing the BRICK RACK Minifigure Display System for your LEGO and Minifigures. BRICK RACK Model 7 features 7 custom grooves designed for LEGO bricks and will display up to 175 of your LEGO Minifigures. Let BRICK RACK be the canvas to your LEGO creations. The Classic Toy Museum is inside the Burlingame Museum of Pez Memorabilia. The Classic Toy Museum celebrates toys that are 50 years old AND are still made today. Displays and exhibits include Mr. Potato Head, Tinker Toys, Slinky, Lincoln Logs, Easy Bake Oven, Ant Farm, View Masters, Colorforms, LEGO and Erector Sets.Guided Tours Daily! Introducing the BRICK RACK Minifigure Display System for your LEGO and Minifigures. BRICK RACK Model 3 features 3 custom grooves designed for LEGO bricks and will display up to 75 of your LEGO Minifigures. Let BRICK RACK be the canvas to your LEGO creations. The Banned Toy Museum is all part of the Classic Toy Museum and the Burlingame Museum of Pez Memorabilia!Toys have been pulled off store shelves for a variety of reasons. Some were very dangerous, and some were politically incorrect. The Banned Toy Museum features many of these toys, including the Atomic Energy Laboratory, Lawn Darts, and the SnackTime Cabbage Patch Doll. Our goal is to educate and entertain you with toys that someone says you can't have!